Tape-in and bonded hair extensions by certified extension artists. We feature EasyHair Pro tape-ins and Hairdreams bonded with spot on color matching and expert application. Tape-In Extensions . We use Easihair Pro tape-in extensions because of the high quality hair and the tape, which is the thinnest and smallest on the market. There are four tape-in services available; Basic Volume, Full Volume, Basic Length and Full Length. Each service is available in three lengths (12", 16" and 20"). Tape-in extensions are suitable for most types of hair, including fine hair and hair that is not strong enough to support the weight of bonded extensions. Tape-ins are not available for curly hair. Please note that tape-in hair is not refundable once it has been applied. 12 inch and 16 inch tape-in extensions are kept in stock. 20 inch extensions must be special ordered, so a consultation is required prior to your appointment so we can color match the hair to be ordered. The consultation for 20" extensions must be scheduled at least 3 days before the application to allow time for the hair to arrive. Please note that special order 20” hair is not refundable once paid for and ordered. 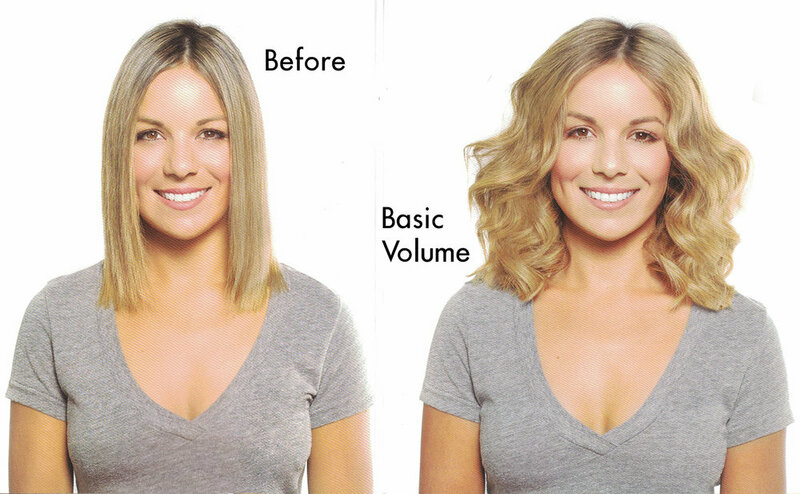 Basic Volume Service. Great for filling out the sides of a haircut or adding flashes for color. $300 (12") - $375 (20"). Full Volume Service. Fills out the sides and back of your haircut while adding to the overall thickness. $490 (12") - $640 (20"). Basic Length Service. Great for natural looking length and volume transformation. $675 (12") - $900 (20"). Full Length Service. Massive amounts of hair for extreme length and volume transformations. $875 (12") - $1,175 (20"). HairDreams Individually Bonded Extensions. Individually bonded extensions are luxurious and a large amount hair can be added to your existing hair, but they are not recommended for fine hair, especially if it has been heavily lightened or subjected to extensive heat (daily flat ironing, etc). Our bonded extensions are available for curly and wavy hair. Bonded extensions require a $75 consultation (pre-paid) that is applied to the cost of the service. Please note that the cost for bonded hair is not refundable once it has been ordered. Adds thickness to your hair without adding length. Great for first time extension clients. Hair extensions are added where needed, or applied evenly through the hair, resulting in thick ends without the traditional weight of extensions. 100% virgin, remy human hair that we color match. Small individual bundles of hair bonded to your own hair strands with tiny heat activated protein bonds. Two to three hour application time is typical. Can be worn four to six months depending on how fast your hair grows. Extensions cannot be moved up the head. At the end of the wearing period, extensions are removed and replaced with a new set. An initial blending cut is included. Follow up maintenance cuts are required to keep your extensions looking good. A consultation is required prior to your service. The consultation is a service that includes measurements along with color and texture matching. The consultation fee ($75.00) is applied toward your purchase price. What should I be looking for when shopping for salon applied extensions? Two things affect your final look. The first is the talent of the stylist doing the design and application. Lots of salons do extensions, but not every salon does them well. The second is the quality of the hair and the attachment method. This varies according to which brand of extensions is used. We offer bonded, which are very small individual bundles attached to small sections of your hair with a heat and protein bond. Tape-ins are applied just as the name implies; they are wefts of hair that attach with a very thin transparent tape that is part of the extension. The tape is almost invisible. Can I remove the extensions myself? We strongly advise you not too, because doing so can be damaging to your hair. Bonded extensions are put it to stay and are almost impossible to remove without the removal solution and bond breaking tool we use. Removing tape-ins yourself will likely result in some torn hairs and weird areas in your cut, but doing that it is not nearly as damaging as trying to remove bonded extensions on your own, which will result in losing considerable length and a very uneven ragged looking "cut". Without the proper tools, supplies and expertise for bonded removal, you'll basically be tearing your extensions out. We provide a removal service for tape-ins that is comparable in price to a hair cut. The price to remove bonded is comparable to a highlight, although in some cases where the extensions have not been cared for as recommended, it can be higher because it takes us longer. Why do I have to pay a consultation fee for bonded extensions? Unlike all our other consultations, consultations for bonded extensions are not free, because they take 60 minutes, during which time our stylists can schedule a haircut or highlight. Another reason we charge for extension consultations is that this service attracts a lot of "window shopping". Before we charged for consultations, about half the people who got the consultation didn't show up for an application. We apply the consultation fee toward your purchase if you proceed with an appointment for application. Is there a real difference between brands of extensions? . Simply put, yes. There are four or five major brands that feature top of the line hair and bondings, and we have used four others before settling on Hairdreams® and EasiHairPro®. The quality of hair and attachment method can vary widely between brands, so if you see extensions offered at a price that just seems too good to be true, it's too good to be true. This is because high quality hair is expensive and is getting more expensive all the time. What should I be looking for when comparing price and quality? If you want your extensions to feel like real hair, they need to be 100% human hair with the cuticle layer intact all the way down the hair shaft. This is sometimes referred to as "Remy" hair. Salons price their extensions differently, so find out what's included in your quote. Additional costs can include coloring your existing hair and/or the extensions; a haircut (which is necessary for blending); and products you will need to maintain your extensions. A blending haircut is included with all our extensions. Add everything up to get your actual cost and get a price quote in writing. How long will my extensions last? If you follow the simple home care program, the longevity of your extensions is a result of how fast your hair grows, because the extension bonds will move down your head as your hair gets longer. Three to six months is the range on bonded, depending on growth rate and how well you maintain them. The wearing period for tape-ins can be longer if you take good care of them. 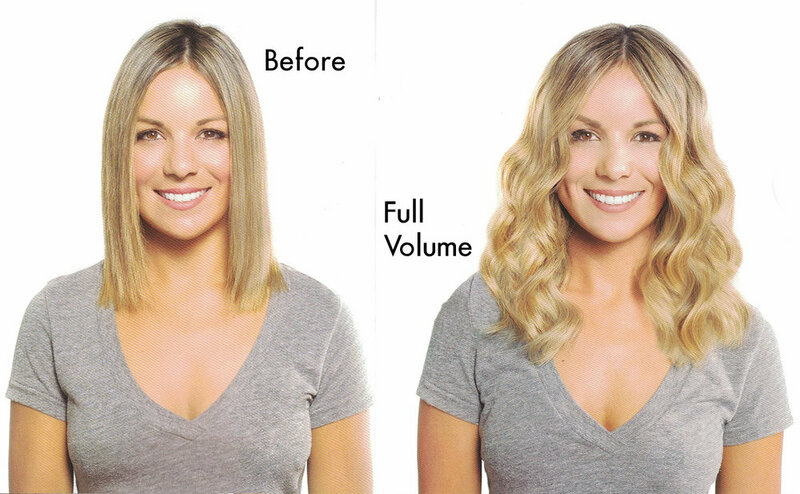 Tape-ins can be moved up your hair as it grows much more frequently and inexpensively than bonded extensions can. Can I re-use my extensions more than once? Hairdreams and most other top of the line bonded brands say you can re-use your extensions once or twice, a process they call "re-bonding", but we don't do this, because in our opinion, re-bonded extensions don't look nearly as good as the initial application. Another downside to re-bonding is that you have to go without your extensions for weeks while the old ones are being re-bonded at the factory. Tape-ins are designed to be moved up every six weeks or so and are re-used continually until they don't look good. (All extensions wear out and lose hair over time). Are extensions hard to take care of? No, but they can take more brushing than you may be used to, and the brush must be of a certain type. Additionally, you must avoid certain types of shampoos and conditioners. In addition to the special brush and care in choice of shampoos, a regular follow-up blending cut is a crucial requirement for the longevity of your extensions. How can I tell if I'm not a good candidate before I pay for a consultation? There are several reasons extensions may not work for you. If you are allergic to nylon, we cannot use Hairdreams® bonded extensions, because there is nylon in the bonding tip. Additionally, if you have a large patch of scalp showing due to thinning hair or medical treatment you may not be a good candidate. We would need to see you to make a final determination. Do I have to pay all at once? For bonded extensions, the cost is split into two payments. Payment 1, which covers the hair is due prior to scheduling the application appointment. One the hair is purchased it is non-refundable, because we can't return it. Payment 2 for the application is due the day of your extension application service. Tape-in extensions are paid for in one payment.